Easy Step by Step Vinyl Installation instructions & Video Guide for Vinyl Stickers, Signs and Vehicle Decals. Stick it right the first time! Make sure the surface of the vehicle/sign board is clean and clear of dust & dirt. Make sure the surface is dry and not too hot. Work undercover or shade, do not try to apply in the sun as it will soften the vinyl and make it very difficult to work with. 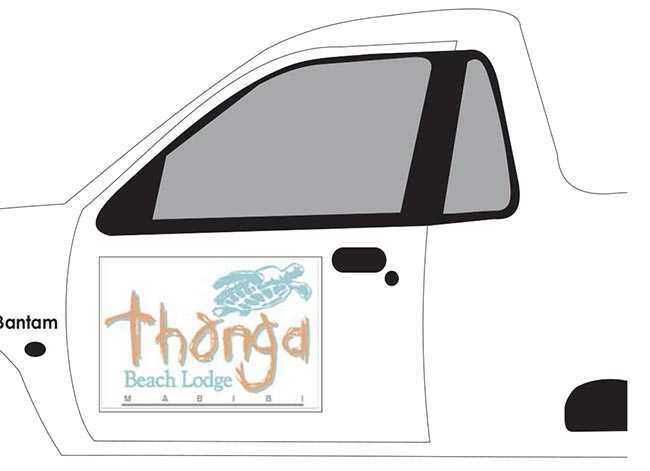 Place your complete decal as supplied roughly in the correct position on the vehicle/sign board where you are wanting apply it. To make sure the decal is straight. Measure the distance from the bottom Left side of the Decal down to the bottom of the door/sign board. 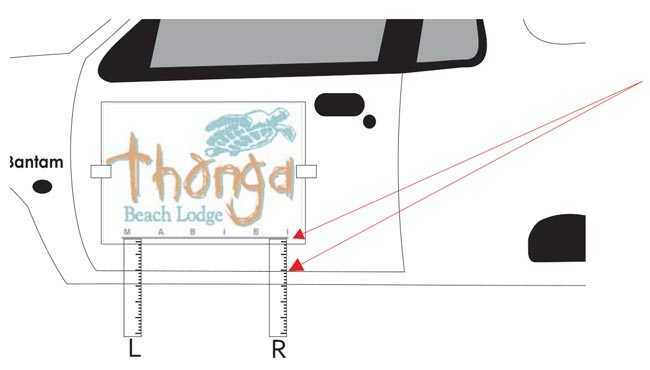 Then measure the bottom Right side of the decal to the bottom of the door/sign board. Make sure both measurements are the same. If not, lift the white offcut strip on one side and adjust up or down as required. Take another two white offcut strips and remove backing paper. Apply on the top and bottom of the decal as shown here. Peel the transfer tape and vinyl from the backing paper up to the halfway point & offcut strips. Then trim the backing paper as shown here. Using a spray bottle filled with water and a drop of dishwashing liquid. Wet the sticky side of the vinyl. Note: this is optional as vinyl can be stuck dry if preferred. If you are nervous, use water. Using your squeegie slowly flatten the viny & transfer tape against the surface of the vehicle/sign working in one direction from Centre of the decal to the outside edge until the entire side is flat and all water and air bubbles have been squeezed out. Note : Do not rub backwards and forwards with the squeegie as this will trap air bubbles under the vinyl. Remove the rest of the offcut strips and repeat steps 6, 7 & 8 above for the other side of the decal. Leave to stand for half an hour to allow the decal to dry. Now slowly remove the transfer tape ensuring that the vinyl stays behind on the vehicle/sign board. Carefully squeegie the vinyl one more time to ensure it is all flat against the vehicle/sign board. Note : if you do find there are bubbles, prick with a pin and squeeze the water out. Air bubbles do settle down after a week or two so don’t panic if there are lots of bubbles the first time you attempt this.